Holy moly, this is awesome! A suitably epic tribute to the great J.R.R. Tolkien! Long Live JRRT! It would have been his 129th today! I really enjoy your entire portfolio and think you have a good sense of composition and style. However - in this case, I seriously doubt that the Ring verse which is *actually* a Curse should be used as a 'halo.' Hmmm...??? Wow, absolutely adore this, I love the detail and the subject chosen, it's all amazing. So nice! Like his arch look. A beautiful tribute to my favourite author. the greatest writer who ever lived. This is *fantastic*. Really. I'm working on a compilation of illustrations for his songs and poems! this image is really beautiful, though. I love the originality in this, its really good. I love your interpretation of Gollum. Too many people try to make him look like the movie one. Wow, really brilliant! Beautiful lineart and shading. 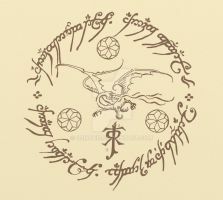 I love Lord of the Rings i just wish Tolkien didn't die. His stories are amazing. Well, that little book is lovely. and this is, too, as always from you. So much epicness in only one pic! Awesome! Cheers to the master! Awesome, I love Gollum in this piece. That is impressive. I love that Eowyn, but truthfully I love them all. OoooOoooh. You have an interesting Gollum. Gollum is amazing. Great work.